SINGAPORE - It was in late August that the Singapore General Hospital (SGH) reported to the Ministry of Health (MOH) it had identified a cluster of 21 hepatitis C cases and suspected they were linked. On Sept 3, after reviewing SGH's report, Associate Professor Benjamin Ong, the director of medical services (DMS) at MOH, met SGH clinicians. They told him tests showed the virus in the 21 cases was related. They also said they had taken enhanced control measures and noted there had been no further cases after June 24. Dr Ong then asked for specific steps to be taken, including confirmation by the Agency for Science, Technology and Research (A*Star) of SGH's findings, screening for staff who had been exposed, and external representation on the committees being set up by the hospital to review its medical and patient safety processes. Dr Ong asked that the work be done expeditiously, and no later than two weeks. In the investigation, the primary consideration has been to try to get to the root cause of the issue as soon as possible, exploring all possible angles, to prevent recurrence. At the same time, the teams from SGH and MOH were mindful of the need to make public the cases as soon as preliminary investigations were completed. The ministry on Wednesday (Oct 7) released this information, giving a detailed timeline in response to queries on why it had taken so long to inform the public of the cluster. In mid-May, SGH had suspected that kidney patients might be contracting the liver infection while in hospital. Its tests showed the patients were infected from the same source, though that has not been found. Eight patients died, with four deaths thought to be linked to the hepatitis C infection. MOH was notified of the 22nd case on Sept 21. • On Sept 4, an MOH team visited the renal ward (Ward 64A and 67) and were taken through the processes by SGH. • On Sept 7, an A*Star laboratory confirmed SGH's initial findings that the 21 cases were related. • On Sept 9, SGH began screening all doctors and nurses who had taken care of the patients. Altogether, 76 staff members were screened and found negative for hepatitis C.
• The Medical Review Committee and Quality Assurance Review Committee also met in September. • On Sept 18, Health Minister Gan Kim Yong was told about the cluster. He requested a briefing from SGH, who asked to see him on Sept 25 to give them time to complete their investigations and report. After the briefing, Mr Gan instructed that an independent review committee be set up, and for SGH to make public its preliminary findings. • On Sept 28, the members of the Review Committee were appointed by Dr Ong, comprising clinicians from different disciplines. • On Oct 6, SGH held its media briefing on the cluster. The ministry said in its statement on Wednesday: "In the investigation, the primary consideration has been to try to get to the root cause of the issue as soon as possible, exploring all possible angles, to prevent recurrence. At the same time, the teams from SGH and MOH were mindful of the need to make public the cases as soon as preliminary investigations were completed." It also said on Wednesday that it had previously been notified by the SGH laboratory of the cases as all acute hepatitis C infections must be reported within 72 hours. However, as the patients did not have symptoms such as jaundice, the cases were not classified as acute and therefore were not flagged in its weekly infectious diseases bulletin. MOH said it had reclassified those cases and would update the bulletin. 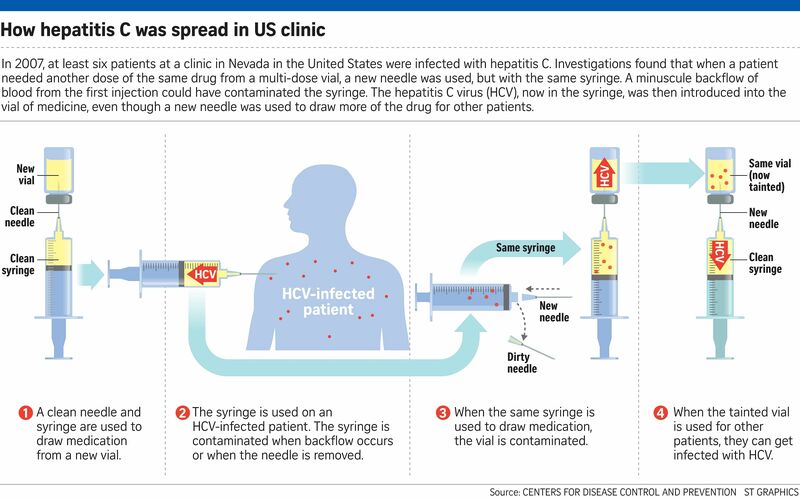 The cause of the infections is still under investigation, with the use of multi-dose vials - in this case to deliver insulin - under suspicion. At least one hospital, Mount Elizabeth Novena Hospital, is already starting to review its practices for multi-dose vials, said Dr Leong Hoe Nam of the Rophi Clinic there. "I think all of us have a duty of care to review our practices, to make sure that we're doing things right," said Dr Leong. Multi-dose vials hold more than one dose of medication and can be shared between two or three patients. Brand new needles and syringes are always used to extract the contents .